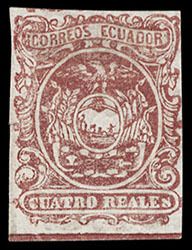 Ecuador, 1866, 4r Red, nine mint singles in shades; early printings in carmine, red brown, deep scarlet and dark vermilion, later printings in rose red, rose, pale rose and brown red, all but two with o.g., couple later printings with small flaws, margins overall better than normally encountered for these narrow margin issues, F.-V.F. Scott No. 6 Estimate $1,500 - 2,000. 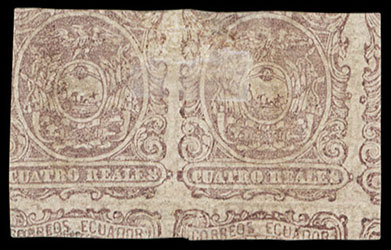 Ecuador, 1866, 4r Deep Rose, top right corner margin single, o.g., margins large to just touching with full margin rules, strong bright color, Very Fine and choice. Scott No. 6 Estimate $200 - 300. 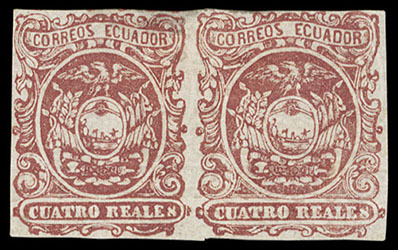 Ecuador, 1866, 4r Brown Red, Printed on Both Sides, 2nd printing, horizontal pair, right stamp "round medallion" variety, o.g., hinge remnant, margins clear to just touching scroll at top right, fresh with bold color, Very Fine, very rare with few multiples known, especially so se-tenant with the "round medallion" variety, ex-Goeggel; with 2013 Moorhouse certificate. Scott No. 6c Estimate $500 - 750. 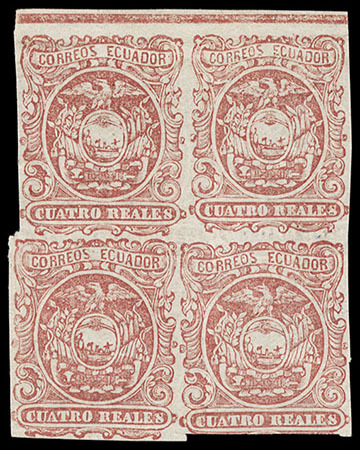 Ecuador, 1866, 4r Brown Red, 2nd printing, block of 4 (positions 79-80/92-93), o.g., hinge remnants, ample to large margins showing small portion of margin rule at bottom, rich color, small closed tear at bottom left of top left stamp, otherwise Extremely Fine, an extremely rare mint multiple, one of the largest known, ex-Goeggel; signed Buhler, with 2013 Moorhouse certificate. Scott No. 6 Estimate $2,500 - 3,500. 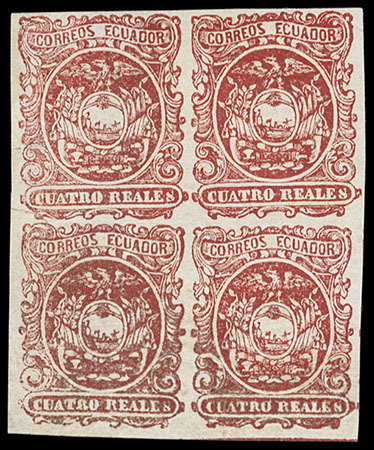 Ecuador, 1866, 4r Red, Printed on Both Sides, three singles; two unused in shades, one o.g. 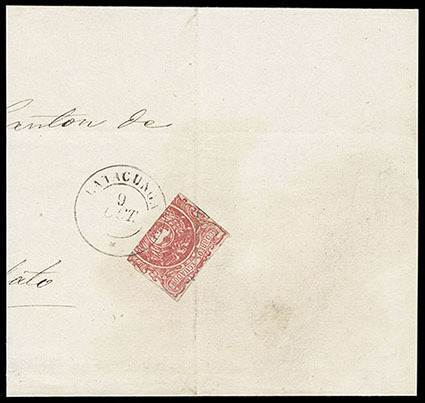 (corner margin thin) and other a marginal single with no gum, also a used example with red town cancel, F.-V.F. This variety is one of the scarcest of the first issues. It is believed that an initially too light impression led the printer to repeat an impression on the back side of the paper in some sheets. 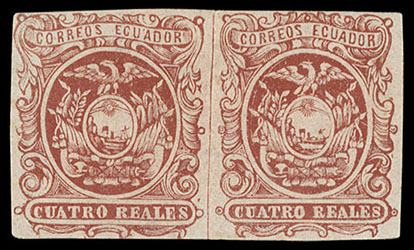 Ecuador, 1872, 4r Red, Reprint, horizontal pair (types 2A/2B), o.g., never hinged, Very Fine, this reprint was prepared by Emila Rivadencia at Quito and printed by her brother Manuel. Scott No. 6R Estimate $100 - 150. 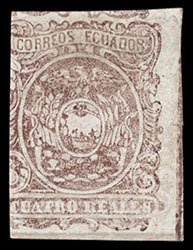 Ecuador, 1866, 4r Dark Carmine, 2nd printing, horizontal strip of 3 with center stamp "round medallion" variety, full o.g., margins clear to just shaving, rich bright color, vertical crease in right stamp and light diagonal gum crease affecting others, Very Fine appearance, multiples larger than a pair are of considerable scarcity, ex-Olgieser. Scott No. 6, 6b Estimate $1,000 - 1,500. 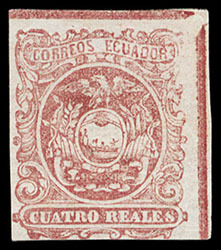 Ecuador, 1866, 4r Red, Horizontal Bisect, upper portion of stamp tied by "Latacunga, 9 Oct" cds on part cover to Ambato; file fold affecting stamp, Fine, a Unique Usage of of a the 4 Reales Issue in Horizontal Bisect Format, bisect usages were rarely used from Latacunga. Scott No. 6d Estimate $750 - 1,000. 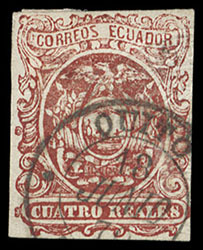 Ecuador, 1866, 4r Red, Embossed Arms, three singles in shades bearing the dry embossed seal, various cancels including 1870 Quito circular date stamp and "3154" in dotted lozenge, one with small margin thin, otherwise Very Fine, few examples are recorded. Scott No. 6 Estimate $750 - 1,000. 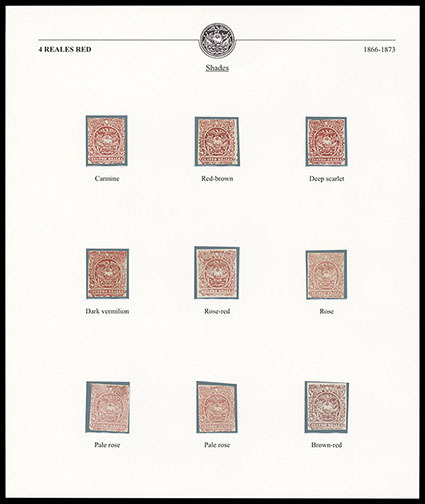 This variety occurred in one or two positions in the sheet of 104 being generally located in positions 12 & 13 (upper right corner of the sheet).